Wow! The Green Bay Packers comeback victory over the Chicago Bears was a game for the ages. It’s certainly one I will remember for a very long time, but when breaking down the game there was plenty of credit and blame to go around. This may end up being one of the games you point to as a highlight to his Hall of Fame career. An absolute gutty performance to come back in a lot of pain with limited mobility and play at the level we’ve come to expect from number twelve. The touchdown throw to Geronimo Allison may be one of the best throws of his whole career. I typically hate the greatest of all-time talk, but this truly was an all-time performance. Rodgers proved he is worth every penny of his extension. I think some fans will pin the blame for the first half on the coaching staff, but even if you believe that, they made the perfect adjustments at halftime. The quick passing game absolutely shredded the Bears secondary, and the no huddle had the pass rushers gasping for air. I loved Mike Pettine’s adjustments to force the Bears to run by playing Dime as a base defense. If the Packers are able to tackle a little better, the Bears wouldn’t have had any offense in the second half. His creative blitz schemes confused Trubisky a few times and caused some very errant and ill-times throws. McCarthy’s staff definitely got the upper hand on Matt Nagy in round one. I loved that Cobb got chippy about people questioning his value to the team. Admittedly, there have been times where I’ve wondered if he was worth the contract he has, but he showed he still has what it takes to be an impactful wide receiver in the league. Obviously, the go-ahead touchdown was what people will remember, but his catches over the middle of the field were crucial to the comeback. Clay was absolutely atrocious in this one. He took terrible angles, missed tackles, and over-pursued which left running lanes for Mitch Trubisky. His Pro Football Focus rating was dead last in the league for edge rushers. Then to top it all off he almost blew the comeback of the century with the dumbest roughing the passer penalty of the whole weekend. He has a lot to prove to not lose most of his playing time to Reggie Gilbert. This one pains me a bit because I am really high on Kizer. He showed some good pocket presence and accuracy hitting on a few throws to drive Green Bay into the red zone. His decision making from there on out was really bad. He missed an open receiver on the strip sack by Khalil Mack, and then didn’t protect the ball. Mike McCarthy shouldn’t have called the screen pass, and it was poorly executed, but Kizer needs to know to swallow the ball in that situation. I’m still convinced he’s going to be a good NFL quarterback, but he didn’t gain the vote of confidence of Packer nation that he would be ready for a spot start next weekend. 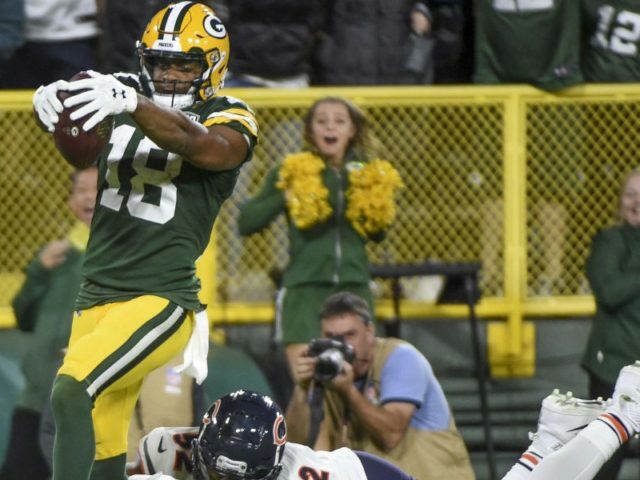 It’s good to reflect on who played well, and who could use a little improvement, but now the Green Bay Packers will need to put the celebration in the rear view mirror and move on to the difficult task of preparing for the Minnesota Vikings. This entry was posted in Andrew Mertig, Packers 2018-2019 Season and tagged Aaron Rodgers, clay matthews, Deshone Kizer, Green Bay Packers, mike mccarthy, Randall Cobb, Studs & Duds. Bookmark the permalink. Mathews needs to bounce back against the Vikings or take a seat and let Gilbert play. EDGE and an offensive lineman are priority one in the 2019 first round draft. GO PACK GO!!! Protect The Franchise He’s shown you why! !